A regional daily has admitted it was “deceived” after republishing a weekly newspaper’s year-old picture of a man holding up a giant rat. The Liverpool Echo published a story in its Sunday edition about “mutant” super rats invading the city, which was later picked up by its national stablemate the Daily Mirror. It was illustrated by a picture of Highgate man Adrian Whitaker holding up a 2ft-long rat found in his home which was originally published in the Hampstead and Highgate Express last year. The Echo story, which has since been removed from its website, wrongly claimed that the rat had been caught in Liverpool, and that the photo depicted pest controller Sean Whelan holding the dead animal. It led 35-year-old Mr Whitaker to issue a stinging e-mail to both titles accusing them of deception. “I do not live or work in Liverpool nor have any association with Whelan Pest Control Services. I originally gave permission for my image to be used to highlight a serious local issue. I certainly did not give permission for it to be used in a national newspaper,” he wrote. A Trinity Mirror spokesman said: “We were deceived about the picture of the giant rat. We were led to believe that it had been taken recently on an industrial estate in Liverpool. I dunno. You’d think with a picture like that, someone on the news desk would’ve had the nous to smell a rat. ‘Deceived’ or too lazy to do the most basic of checks. Surely they contacted the finder of the big mouse to see if he would be interviewed/pose for a picture alongside the mobile phone snap. 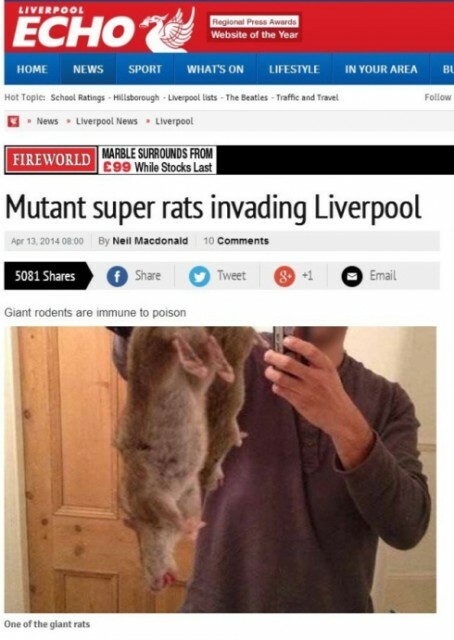 Baffling story, the idea that ‘mutant rats invading Liverpool’ is stated as fact yet there, presumably, no contact with the random person that sent in the photo, no interview, certainly no consultation with the authorities to find out if it was true, council, environment agency etc. Presumably I could just email a picture of myself with a quiff asleep on the lavatory under the banner ‘Elvis lives’. It’s obvious this brave new era is about what’s in the top left hand corner of that screenshot ‘5081’ shares. All we want is shares, Tweets etc, the quality of what’s actually being shared doesn’t seem to matter anymore. Today’s news is tomorrow’s chip wrapper – or for those who can remember it, the opening titles of Lou Grant on tv where the LA Tribune went from squiggles in a notepad to line a budgie’s cage in a day. One day (very soon) that kind of transience will be looked on as longevity as we continue to gobble up and spit out infotainment. Are these the same mutant rats that were recently heading towards the UK on board an abandoned cruise liner – with the King of Rock n’ Roll lashed to the wheel? The Echo phoned me trying to get a story last Thursday. Im a Liverpool pest controller. I told them rats where always big (14 inches not 2 foot though) and that resistance in rats was not much of an issue in Liverpool but it was getting much worse in mice. They asked to use a photo on my business Facebook page from Jan last year. I said fine they said I’d be in the paper on the Sunday. When I looked it was a pest controller from down South making the statements. Its pretty shameful really. Papers are not checked properly any more. Someone will pay one day.